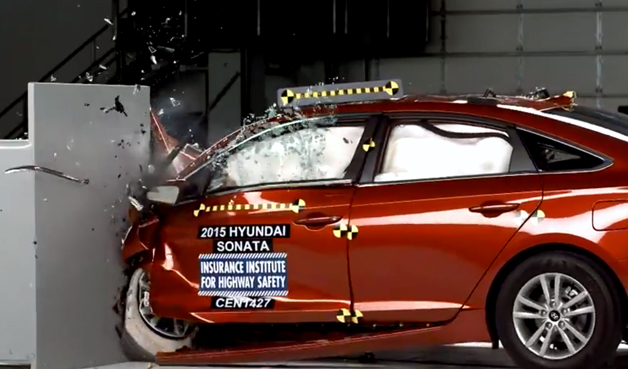 Hyundai has managed to get another vehicle on the prestigious Insurance Institute for Highway Safety's Top Safety Pick +, as its new 2015 Sonata sedan performed admirably in crash testing. The redesigned Sonata's new look belied an improved crash test in the difficult small overlap front test, where Hyundai's family sedan improved from a "Marginal" score to "Acceptable." Meanwhile, the Sonata's optional Forward Collision Warning system garnered a "Basic" rating on IIHS' three-tier rating scale for these sort of automatic safety systems. Netting a spot on the Top Safety Pick + list requires a "Good" or "Acceptable" score on the small overlap test, as well as "Good" scores on the four standard tests and some form of automated safety system. Watch the 2015 Hyundai Sonata crash its way to an IIHS Top Safety Pick+ rating originally appeared on Autoblog on Fri, 18 Jul 2014 18:30:00 EST. Please see our terms for use of feeds.